For more than a decade, the pride of the Oakland Athletics hasn't been a slugger or a hurler, but a general manager. In Moneyball, Billy Beane (Brad Pitt) inhabits the mantle of perhaps the unluckiest man on the face of the earth - the steward of a poorly-equipped and poorly-funded franchise consistently outbid by cash-rich clubs like the New York Yankees for the services of Athletics-bred stars, with the same attendant pressures to field a competitive team. It's the story of how Beane tried to minimize the effects of that bad luck by employing sophisticated statistical analysis and unconventional thinking on a heretofore unseen scale in the romantically regimented world of professional baseball. Based on a nonfiction bestseller by business writer Michael Lewis, the film dramatizes a long, gradual philosophical schism that spanned several years and involved dozens of individuals. Is this sounding cinematic yet? Sony Pictures didn't think so in 2009, when it pulled the plug on a Steven Soderbergh-helmed adaptation that reportedly included documentary-style interviews with the book's subjects and a cartoon version of Bill James, the real-life pied piper of the new statistical revolution. Ironically, but unsurprisingly, the project had to take a more conventional approach to the story by spinning it into a tale of personal redemption. Enter Brad Pitt, without whom Moneyball probably wouldn't exist, and another in a recent run of laudable performances. Exuding both fatherly consternation and adolescent arrogance, Pitt plays to many more facets of the boss than you'd expect, and not all of them rosy. He has a capable foil in Jonah Hill, displaying impressive dramatic chops in a revelatory turn as the Ivy League number-cruncher who turns Pitt on to a world of talent buried by the doublespeak of old-line baseball scouts. Indeed, Beane was once a can't-miss prospect who had his dream nurtured by men who gushed about his "tools" and then bounced around the big leagues as a casualty of inflated expectations and reliance on unempirical observations. The flashbacks to a young Beane are the film's most affecting sequences, a novelistic rise and fall of a kid whose only failing was looking too much like the perfect athlete. Moneyball is fortunate to have Wally Pfister, the photographer who has done such arresting work for Christopher Nolan, who stages the baseball scenes like black-box theater. He captures not the Athletics' heroic calm but the many levels of pain, worry, and fear in modern pro sports. Even though Pitt and Hill have total confidence in the way they've built the team, each victory is as much a surprise as a validation. 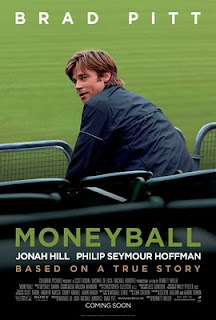 Overall, though, Moneyball is more of a sliding triple than a home run. Pitt's arc with his daughter (Kerris Dorsey) feels shoehorned in and calibrated for maximum female swoonage. Their scenes are oddly strained, as if playing the good twin of the father figure he portrayed in Tree of Life bores Pitt to death. Philip Seymour Hoffman is also underutilized as the A's combative manager. The script prefers to match Pitt with his straw man scouts in arguments that are too on-the-nose and laughably direct. It muddles the message of a story that's really about resistance to change and frailty of the human ego, just couched in baseball's philosophy du jour. When one scout snaps that you can't build a winning team with computer formulas, Pitt counters, "Adapt or die!" He's a pragmatist or, at best, a bemused pioneer. Moneyball loses that thread at times, maintaining that Beane revolutionized the game, when it's really the game and the numbers and the circumstances that have changed him. That's a story more compelling than any ragtag quest for a championship ring. Liked by the rest of your immediate family as well.